It would have been hard to have missed what was written on the wall. Painted in giant whitewashed letters: ‘SHARKEY IS A GRASS’. I hadn’t a clue who Sharkey was, but I knew one thing. ‘Sharkey’s a dead man,’ I said. Leo knows the value of never grassing and that you never grass on your friends. Everybody, too, knows the gang leaders in town. And you don’t grass on them. Not unless you don’t value your life – like Sharkey. And then Leo is unlucky enough to witness the murder of one gang leader by another, a man called Armour. Leo is petrified as he realises what he is witnessing and even more petrified when he realises that Armour has seen him. Sure that he is drawing his own last breath, Leo silently says goodbye to his family and everybody he knows. But all Armour does is wink at Leo, very slowly, and leave the scene of the crime. Leo draws a long breath of relief. He has got away with it. But he hasn’t – not really. Leo will live to regret that wink and realise that Armour has an insidious hold on him and his family, which will test his family relationships, and his very sense of what is right and wrong. It will take bravery, luck and sheer daring to extricate himself from Armour’s deadly web. 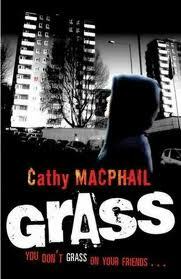 Categories: Crime, Scotland, Thriller | Tags: Cathy MacPhail | Permalink.